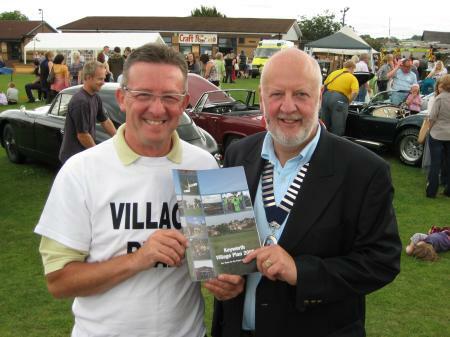 Trevor Dobson, chairman of the Village Plan group, hands a finished copy of the Village Plan to Tony Grice, chairman of Keyworth Parish Council at its launch at the 2009 Keyworth Show. Click here to visit the Village Plan website, on which can be found a copy of the plan, subsequent action plans, etc. N.B. The Village Plan group is an autonomous group which operates independently from the Parish Council, and the Village Plan and Village Plan website should not be regarded as representing Parish Council policy.